Near frighteningly good value for money, where playability and tonal range seal the deal on this do-it-all Strat. The price. Great range of tones. Playability. The finish is poorly executed in places. Compared to the other new twists on classic designs that have been in ample supply from Fender of late, there's nothing particularly special about the Modern Player Stratocaster HSS. It has an alder body, bolt-on maple neck and an old- school 'Synchronized' vibrato. Sure, it has a humbucker chiselled into the bridge position, but Eddie did that over 30 years ago. The 241mm (9.5- inch) fingerboard radius and 22 jumbo frets promote the slick, modern feel we expect from Fender instruments. "What makes this guitar worthy of your attention is how it delivers a great payload of tone and playability for not a lot of cash"
What makes this guitar worthy of your attention is how it delivers a great payload of tone and playability for not a lot of cash: a quick Google search will return some great prices. 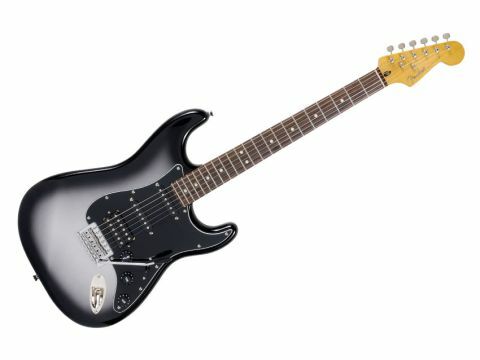 The build quality isn't quite a match for, say, the recent Fender Blacktop Strat HSH - the finish isn't ultimately as flat, for example - but the Modern Player comes pretty close. Approach the Modern Player Stratocaster HSS without knowledge of its unassuming Fender logo on the headstock doesn't hurt, but it's the playability and tonal range that help this Strat punch above its weight. The single-coils have that glassy tonality any great Strat should have. The bridge 'bucker has plenty of bite, but it's no overwound monster; you can split it with the push/ pull tone control. Like its sister model, the Modern Player Telecaster Plus, this guitar offers a great palette of tones, only in a more visually traditional package.